NATO members are worried that President Trump could blow up next week’s NATO summit. But the real problem is even bigger and goes beyond the summit: the very basis of the transatlantic relationship is changing. NATO should prepare for a longer phase of instability. NATO summits are usually highly organized events. Heads of State and Government adopt previously negotiated decisions and define work plans up to the next summit. Above all, they aim to demonstrate unity and solidarity so that friend and foe alike believe that the NATO allies will defend each other in the event of a crisis. But this summit threatens to disrupt this process, because no one knows how US President Trump will behave. Will we see a revival of a brash Mr. Trump G7 Summit when the US President retrospectively ‘unsigned’ the communiqué via tweet? Or will he act as a patriarch, whose stubborn grumblings are ultimately met with cooperation, and keep the family bound together? The problem is: anything is conceivable. First, because President Trump enjoys disruption, and takes pleasure in ignoring traditional rules of diplomatic behavior. Second, the last months have revealed structural transatlantic differences. Stark contrasts between the foreign policy objectives and principles of most Europeans on the one hand and the United States on the other mean the upcoming summit will be rife with strategic disagreements. This year’s summit aims to further NATO’s strategic adaption launched in 2014 following the annexation of Crimea. The adaption was adopted in order to strengthen deterrence and defense capabilities in the East, improve NATO’s tools for the south, deep EU-NATO cooperation, and reform NATO’s command structure. In light of recent political changes in Macedonia, the question of inviting that country to join NATO will also likely be discussed. But whether member-states want it or not, one dominant issue will be burden-sharing, with President Trump lambasting European partners for spending too little. NATO’s diplomatic routine has typically been able to contain the conflicts that have always existed amongst allies. As a result, allies have been able to demonstrate solidarity at summits as a crucial prerequisite for NATO’s credibility and its ability to act. This is what mattered to all the Allies; because NATO is their life insurance should the unthinkable occur. Yet, this summit might fail in delivering such a demonstration of solidarity. Instead, public conflicts could arise, deliberately started by President Trump or simply not avoided. Such a conflict is likely because the US and Europe have recently defended opposite positions on many foreign policy issues and President Trump has not shied away from conflict. The US, for example, wants to leave the Paris climate agreement, to which Europeans adhere. Washington has unilaterally cancelled the Iran Agreement, while most Europeans want to keep it. President Trump announced a bilateral summit with Russia and his security advisor does not want to rule out recognition of the annexation of Crimea. Yet, this illegal annexation is the reason why many European countries worry about Russia, why they increase their defense spending and why they launched a major adaptation process for NATO to relearn collective defense. Differences are growing in other areas as well. Europeans criticize the US’s increased protectionism on trade issues. Washington’s tendency to link economic issues with security ones deeply irritates Europeans, such as when President Trump combines his criticism of Germany’s trade surplus with his criticism of Berlin’s low defense spending. Eventually, these decisions will point to a new foreign policy: Washington acts increasingly in a unilateral and hegemonic way, and disregards the multilateral and rule-based structures and policies that most Europeans prefer. The June 2018 G7 summit revealed the extent of the rift and its conflict potential and escalated to a point of such disagreement the US retrospectively withdrew its signature from the Communiqué. The result was a painfully disunified West and a stark reminder of fragility of transatlantic relations in the Trump era. These conflicts do not directly affect NATO. Yet, this is precisely the problem. What these conflicts reveal is that the very basis of transatlantic relations is changing. 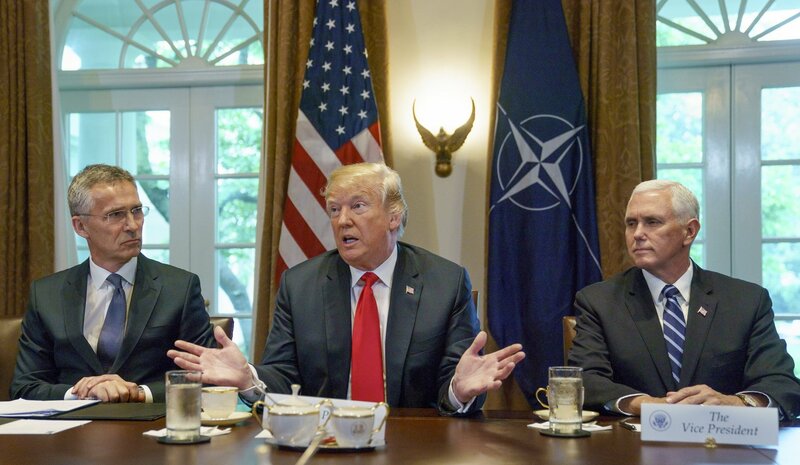 If the US generally questions the political value of alliances, prefers unilateral approaches and feels less bound by agreements, this also affects NATO as the centerpiece of the transatlantic security order. The problem is that transatlantic relations are facing long-term structural problems, with different worldviews. Therefore, a G7 moment cannot be ruled out at the NATO summit. If Washington feels that the Europeans do not sufficiently support the US’s priorities, it is conceivable that the US will refuse the communiqué, question or change contributions, or play off allies against one another. This is dramatic, because Europe’s defense depends on the United States. But the political damage could be an even greater toll. If allies appear deeply divided, the credibility of NATO as a defense alliance where states pledge mutual support put the entirety of Europe’s security at stake. For who takes a publicly divided NATO seriously and believes that allies still stand up for each other? A solution for this fundamental transatlantic dissent is not in sight. Thus, even if we witness a quiet summit, without a major disaster, the problem is not over. NATO should prepare itself for a longer phase of relative tension. And for the Europeans, there is quite a lot of introspection ahead on how to deal with a fundamentally modified transatlantic relationship.